Modern Holiday Home with everything. 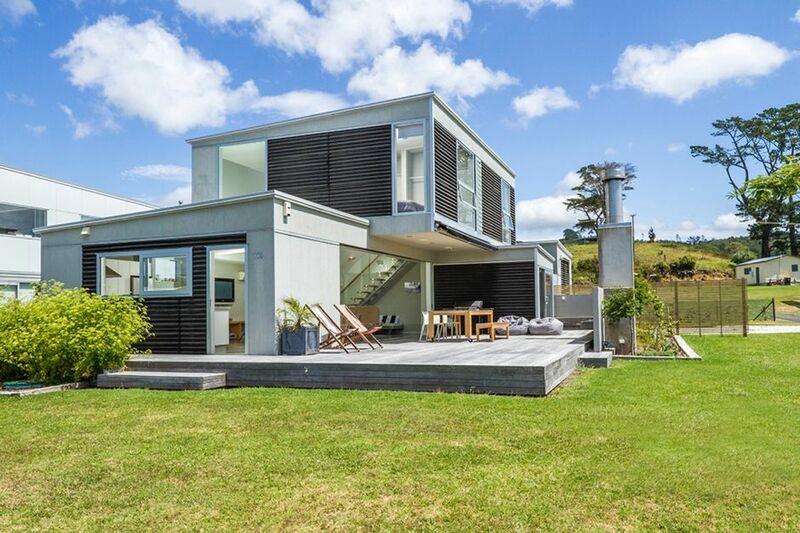 Designed specifically as a beach holiday home to relax in, this modern 4 bedroom beach house has indoor/outdoor living and all the modern conveniences. It is the perfect beach holiday accommodation for one to three couples or families with friends and kids in tow. The large open plan living area opens completely to an expansive deck, BBQ and disappearing sliding doors. Wheel the 10-seater dining table outside and enjoy your evenings eating in front of the outdoor fireplace. Let the Kids loose in the large separate 50sq mtr games room, complete with board games, DVDs, 42-inch flat screen TV and indoor basketball hoop. There are two bathrooms, an extra downstairs toilet and a warm outdoor shower. Bring the kids bikes because the Bach is located in a quiet flat cul-de-sac opposite a reserve and within strolling distance to: Tennis courts (1 min) - Beach, Store and Gas Station (2 mins) - Estuary and Boat ramp (5 mins). Whangapoua Beach must be one of the best beaches on the Coromandel Peninsula and the only way to access the glorious New Chums Beach (15min walk). A round of golf is approx 10 minutes drive to Matarangi. The Coromandel township has a number of great eateries, seafood speciality shops and art and crafts stores. Must eat spots are The Mussel Kitchen (Coromandel Township side - Seasonal opening hours), or a 15min drive to Lukes Kitchen in Kuaotunu for the best pizza experience and traditional MASSIVE Kiwi Ice-creams at the store. Often rented as accommodation for the wedding season we have a washing machine and dryer, also an Iron and Ironing board. The property managers live next door so are easily accessible if you need help with anything. - Xmas and New Year (please enquire). Peak prices apply during public holidays. toilet, tub, shower, Water supply is high in iron and stains toilet and shower. toilet, shower, Water supply is high in iron and stains toilet and shower. Please note the water supply very safe to drink but is high in iron and stains toilet and shower. We also have an outdoor hot shower for rinsing off after the beach. Not available however Cell phone coverage is good. Open Plan, the large dining table is on wheels and can be rolled out onto the deck for alfresco dining. Most guests bring their own linen (kids often in sleeping bags). However, if you are not travelling within NZ, bed linen and towels can be provided at $40.00 service fee per room per stay. Pillows duvets and extra blankets are provided as part of your rental. Please let us know if you require linen. Firewood for the outdoor fireplace is available from Murray next door (at 107 Adamas Rd) for $20 Bag. Great house in a good location. Loved the house but felt a little uncomfortable when the neighbours/landlord kept walking past the front of the house throughout our stay. Otherwise a great trip. Wonderful location with easy access to the beach. The stairs were a bit challenging for under 5’s. Some shade needed in the deck as the awning was faulty. A very stylish property. We really enjoyed our holiday and the house and location were beautiful. We were very disappointed to receive a negative review about our stay there without any consultation orcommunication from the owners. We spent at least a couple of hours cleaning before leaving and also paid for a cleaner. This has impacted on our 10 years of previous great reviews. .
We loved this house - we had a full house of kids and adults and it still felt spacious. It was really well kitted out, and we loved the games room, outdoor shower and fire. It's well located at the end of a quiet cul-de-sac not far from the beautiful beach. We'll definitely be back.